Pour the water into a bowl and bring it to boil. Once done with it, take the bowl out of the heat and add the remaining ingredients to that. Stir well and finally shift the entire mixture to the spray bottle. Sugar is the most important ingredient in this spray that manages your hair. Hence, you can increase or decrease its amount depending upon the desired strength of the spray. The essential oil is an optional item here and is used just for fragrance. Color-treated hair can easily get affected by regular hair sprays. If you can use citrus water in place of plain water, you can prevent your hair color from fading away. Hence, take the lemon or orange and slice it up. Put the slices in a medium-sized bowl and pour the water into it. Now, boil the entire thing at least for half an hour so that the volume of the water becomes half. Add sugar and rubbing alcohol to the bowl and turn off the heat. Keep the bowl aside until the entire concoction gets cooled. Finally, strain it to obtain a fine liquid spray and fill up the spray bottle. At first, you need to heat up the water (do not boil) so that it becomes warm. Pour it into the empty spray bottle. Now, add rest of the ingredients to it one by one. Shake the bottle for a couple of minutes in order to dissolve the salts completely and you are done. 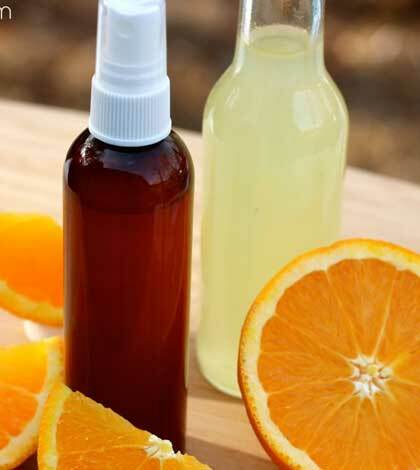 Usually, the rubbing alcohol used in these homemade sprays work as preservatives. You can store the spray bottles in refrigerators to make use of the content up to 3 weeks.